Street Food Goes Organic | Bad Human! Don't take chemicals from strangers! 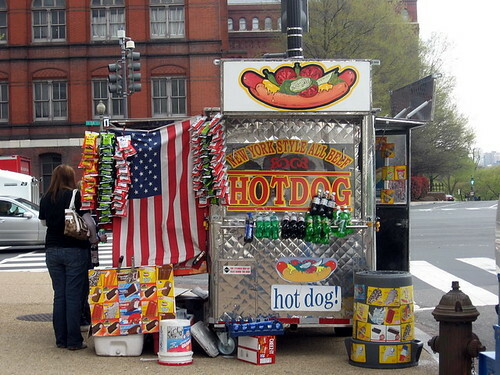 Hot Dog Vendor, originally uploaded by nolageek. I don’t know about you but when I think “street food” this is what comes to mind. I envision New York City and the plethora of hot dog and pretzel stands which don’t seem very green to me or gourmet for that matter. So imagine my surprise when flipping through this month’s Bon Appetit I see a whole page dedicated to street food with the tag line “it’s cheap, it’s messy, it’s fun.” I was ready to hate the article for extolling the virtues of mass produced taco made from CAFO meat and lettuce and tomatoes shipped from who knows where. I was ready to blog about how far our culture has sunk when a supposed “gourmet” magazine is devoting whole pages of copy to this crap. I was mad before I even read the first sentence of the article and after making it through the first description for Ingrid’s Lunchbox in Madison, Wisconsin I was stymied. Ingrid Rockwell doesn’t serve tacos or hot dogs instead she like most of the ten vendors covered by Bon Appetit serves local and organic food in simple and affordable meals. Being inside the Dane County Farmers’ Market can’t hurt either. Some of the vendors do serve things I would call street food but even those take it to a higher level- who wouldn’t want a fresh fish taco served out of a classic Airstream trailer? Isn’t it interesting that we’ve come to think of street food as mass produced junk food? I remember when my husband and I traveled to Guatemala, Belize and other central American countries, we enjoyed so much of their street food, which was all locally grown – corn plucked from the backyard that day, tortilla just made, fish caught a mile off the coast that morning. Perhaps in less-industrialized economies, local food is a necessity rather than a luxury. We need to ask ourself the question: if by “developed country” we mean we eat mass-produced junk food, are we really better off? Great to hear that the local food movement is making headway in all aspects of our lives. It is just better food – on all fronts.